Updated 7/10/2018 Spiralex has eight thin ribs which form delicate flames around the top of the vases. These thin ribs distinguish it from Dugan's similar Wide Rib, which has eight ribs ending in somewhat more bulbous rib points. Spiralex can also be distinguished from Wide Rib by its smaller base diameter, 3-3 1/2 inches, and flatness on top of the collar base (Wide Rib is puffy). Peach opal examples will be Wide Rib. Shown are typical marigold and blue examples of Spiralex. 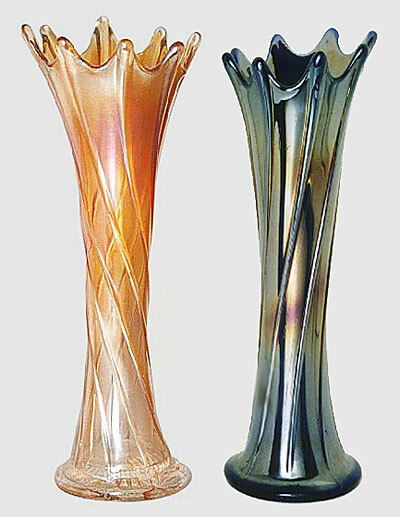 The twist was introduced while the vase was being swung, and can run in either direction.